I love these, too! 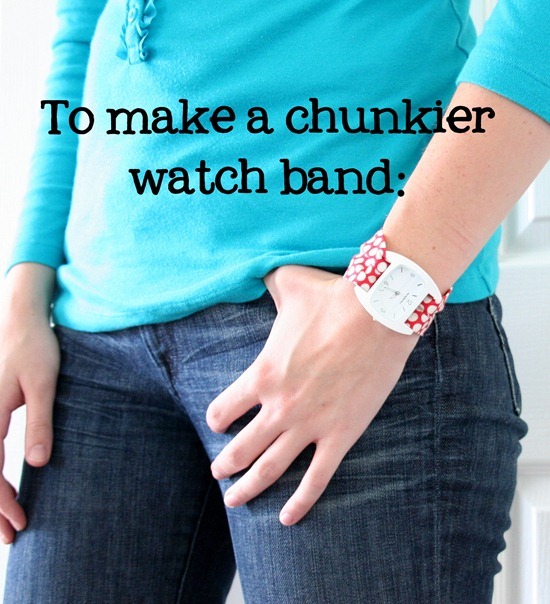 I have a watch this will work great for! I love these but where are you finding the cute watch faces? the technical words you used are my favorite part'SMOOSHED' hahahaha! 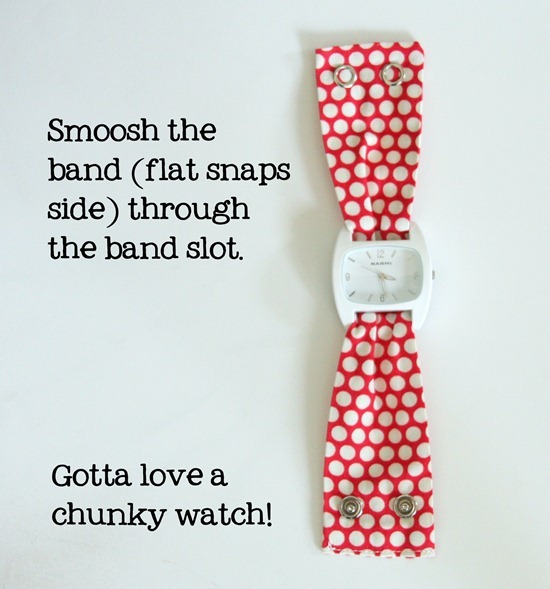 Cute watch bands too!! thanks!! Cute watch. I have to tell you, I love your 'How to Finish a Quilt' Tutorial. I didn't think it was possible to quilt on a regular machine. Obviously I was wrong. Your directions helped me see how it is possible. I can't wait to try it. Thanks so much for sharing. I made a quilt for my blind son over the summer. I tied it with a varity of sets of buttons, so he can feel around and find the match. It is on my blog if you'd like to look at that post. I love your blog and am now following. 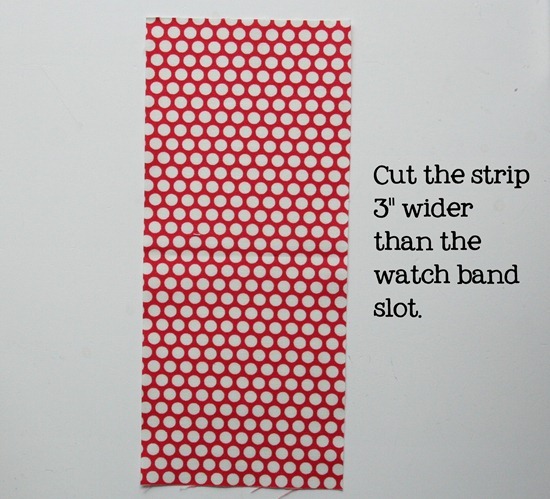 To the person looking for watch faces- someone on etsy(it was posted in the previous tutorial) is selling the same exact faces. I bought one the day the first tutorial was posted and it just came in the mail. Can't wait to try it! I just bought me a BIG DIAL watch. The band had to be cut because it was way too long. Now I am gong to made myself my own band like yours though it will have to be a lot smaller. Will try to remember to post it when I finish. Wanna try to make it this weekend from quilting leftovers. Wish me luck! So easy, but really cool! I would love a watch like this…any chance you know where to find one? I really like this chunkier version! Anyway I can wear MORE fabric… =) Thanks so much, I'll be linking. I am min love with this. 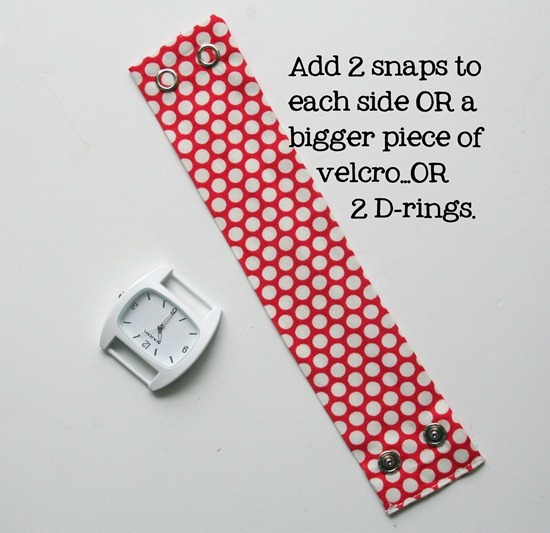 I have been avoiding the chunky bracelett watches because I knew the bulk of the beads would make me INSANE!!!! But this . . . this is TOTALLY doable. Thanks for sharing. I love it, Im gonna get me one!